Welcome to DVMP Pro 7.3. DVMP Pro provides the most comprehensive and reliable method of time-stamping your camera and smartphone video files, or simply viewing the date and time they were recorded as you play them on your computer. You will see the original date and time of recording change in real-time and with frame accuracy. You can choose to have the date and time (or other information) stamped permanently across the video frames, so that it will always be visible when you play or edit your files, or when you import them into your favorite DVD Authoring software. Or see the information instantly simply by playing the camera-original files in DVMP Pro - handy if you don't need a stamped file to be created and just need the information fast. As a camera records a video file, the time, GPS location and exposure details will be continuously changing; so when you play the file DVMP Pro doesn't just show you a single set of values - you can see them change in real-time with frame-accuracy. You can watch the video clip and see exactly when and where a particular event occurred. 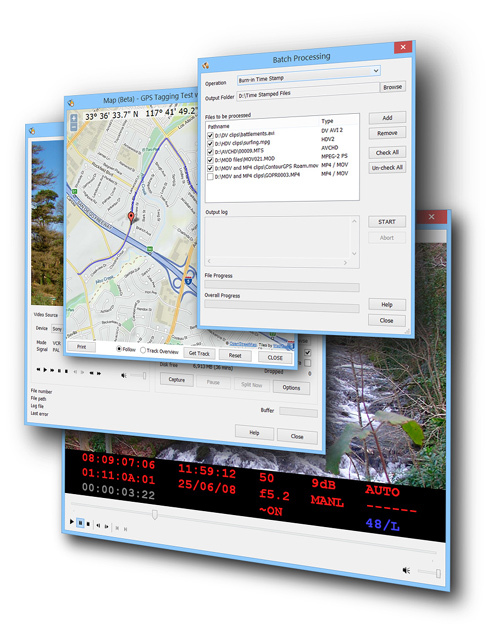 DVMP Pro also has a set of professional tools that include exporting date, time and other information; capturing video from DV (standard definition tape) camcorders; displaying GPS information on a map, and more. DVMP Pro is useful in the investigation, security, military and forensics sectors where you need to know reliably when and where video files have been recorded, and when a particular recorded event happened. The GPS features are also useful in geographic, marine and traffic surveying where you need to know where video was recorded to the nearest video frame. The exact amount of information available will depend on the model of video camera/camcorder/smartphone. Some features will not be available for some models - for example GPS and mapping features are not available if the camera is not equipped with a GPS unit. DVMP Pro is a specialized media player and video time-stamping software, with a set of professional tools for displaying and exporting the hidden metadata information that many video cameras, camcorders and smartphones store in their recorded video files. The amount of metadata that is stored in a video file may vary depending on the make and model of the video camera that created the file. For details of the types of camera video files that can be used with DVMP Pro, see the Supported File Types topic. Playing video files and using the tools require differing amounts of processing power for each supported video file type. Therefore there are 3 levels of minimum system requirement corresponding to each broad type of video file that is supported by DVMP Pro. When using any of the tools, a slightly lower specification may be acceptable - it just means that the operation will take longer to complete. •Core 2 Duo, 2GHz, or better. •Intel Pentium 4 / AMD Athlon 1.2GHz, or better. Depending on the camera model that created the MOV or MP4 file, the requirement may be the same as either 1 or 2 above. In addition, if you want to use 4K (UHD) video files, then you will need a 64-bit edition of Windows rather than 32-bit, and have at least 8GB of RAM. When you play a video file in DVMP Pro you can see the changing metadata in a window pane beneath the video. The display is exactly synchronized to when the metadata values were stored by the camera. You can therefore see the original date and time change in real time as the video plays. The camera exposure details also change exactly as they were stored by the camera. If you have an AVCHD, XAVC-S, GoPro Hero or Contour camera that is equipped with a GPS unit you can also see the latitude, longitude, altitude and speed when the recording was made - and if your recording was made from a moving vehicle you will see the GPS values change as playback proceeds. This can be immensely useful in surveying roads, aerial surveying and oceanography. Limited GPS information may also be available for other camera and smartphone models - this is usually a single static location corresponding to the beginning of the recorded video clip. Drag the slider to any playback position in the file, or use the left and right cursor keys to step/jump forward or backward and the metadata display changes in sync with the new position. See the Playing Video Files chapter for more details of how to play video files. Probably the most popular use of DVMP Pro is for "time stamping" video files - that is, permanently stamping the original date and time of the recording over the video frames. The stamped video can then be sent to a colleague or client; or edited using your own video editing software; or you can make a DVD disk from it by importing the stamped files into your own DVD authoring software. Time stamping your video means that the date and time is always visible on screen as the stamped file is played back. This can be particularly useful in the security, surveillance and related business sectors where the date and time of a recorded event can instantly be seen (provided you set the camera's clock accurately before recording). The date and time can be stamped in any of a huge range of formats, and may even include day and month names. You can choose the font, size and the position that the date and time appears on the video frames. You can also select from a wide range of languages and the day and month names appear in the chosen language. You can also stamp other metadata onto your video such as the camera exposure settings. You can then see how the camera settings had changed as your recording progressed. This may be useful for video training. If you have an AVCHD, XAVC-S, GoPro Hero or Contour camera that has a built-in GPS unit, then you can stamp the GPS information into the video frames. If your recording was made from a moving vehicle then you will be able to see the changing GPS location, speed and altitude as the stamped file is played back. You can also stamp a logo image over part of the video image, or a custom line of text which might be used as an identifier for your video project, or the name of the video file. See the Time-Stamping Video and Burning-In Metadata chapters for more details. DVMP Pro can display GPS coordinates when a video file is being played, but it can also display a map with a marker showing the corresponding location. As the video plays and the GPS location changes, the marker moves across the map to show the "current" location. The map can also show the complete route taken during the recorded video file, and the marker moves along the route. Drag the slider and the map and marker updates to show the current location. Choose between a vector map or aerial imagery. You can also zoom or pan the map, or print it out. In the case of some camera models which only record a single GPS location when the recording commenced, a static marker without a route is shown. IMPORTANT: The "Display Map" feature is not part of the core DVMP Pro product. Display Map is currently in Beta and is therefore provided as an add-on which at present is free of charge. Being a beta add-on it is subject to change or withdrawal at any time. Also, you can use the separate "Browser Map" feature to display a static Google Map of the current playback position in your default Web Browser. A marker shows the current location on the map. 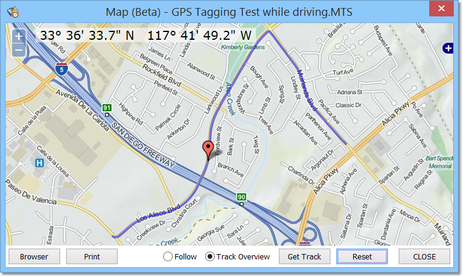 See the GPS Geotagging and Maps chapter for more details of the Display Map add-on and the Browser Map feature. •csv (comma-separated value) - useful for importing into spreadsheets or for processing in specialized software. •srt - a subtitle file that can be used to create DVD subtitles by importing it into some subtitling software. •gpx - GPS eXchange format - useful for importing into Google Earth or other GPS processing software. DVMP Pro's "Capture DV" window allows you to capture from your tape-based DV camcorder to DV AVI files. Capture can be split between multiple files using a wide range of splitting triggers. You can also capture in real-time from the camera direct to the computer's hard drive instead of tape. See the Capture DV chapter for more details. •DV AVI file splitter - splits DV AVI files using a range of splitting triggers. •Extract audio - extracts the audio track from your video file and stores it in an audio file. With the Batch Processing facility you can time-stamp or process lots of files in one go. See the Batch Processing chapter for more details.